When fish go deep around sand and gravel, one of the deadliest jigs to use can be the football jig. 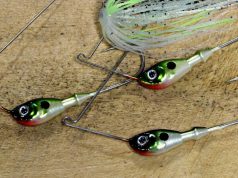 Long time lure maker Marc Wisniewski has been using these jigs for decades, and in this article Marc points out how he likes to fish them, and how you can even make your own! 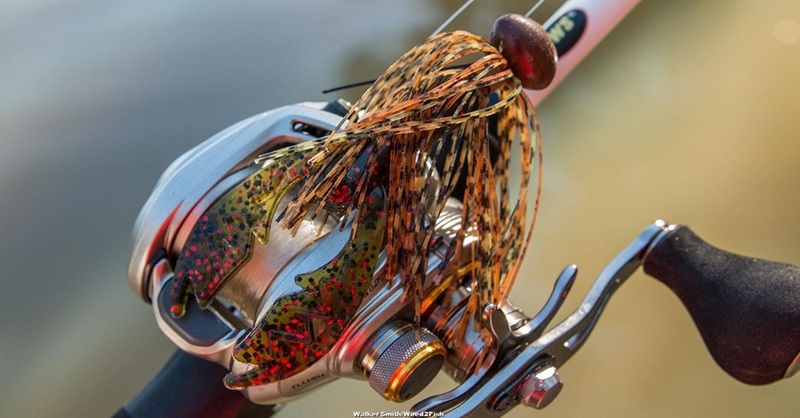 In this article long time lure maker Marc Wisniewski points out how he likes to fish football jigs, and how you can even make your own! Thirty years ago, one of my early passions in fishing was catching Smallmouth bass in the Door County area of Wisconsin. I caught a few on spinners and crankbaits but the tactic that seemed to work no matter what season or what weather conditions were was a crawfish imitating jig fished along the bottom. For those of you that know the Sturgeon Bay, Door County area, you know that the bottom in the entire area is sand, gravel, and rock. It’s Smallmouth heaven. It’s also football jig heaven and the Football jig mold became one of my first ever Do-It investments. Since then, football jigs have become common place among Bass anglers all over the country. Big money tournaments have been won with them, special rods have been developed to fish them and them alone and every major tackle company has a version of their own. A Football jig is such a simple but perfect design. The name pretty much tells the story. It looks like a little sideways football with the hook eye coming out right about where the center of the laces would be. What it’s best at is bashing the bottom, plowing the bottom, making noise, and getting the attention of big bass and other gamefish. You can’t tip it over! In most cases, I try to tell people to try to get away with the lightest jig they can for a given situation. The exact opposite is true for Football Jigs. In the case of Football Jigs, my motto is to use the heaviest jig you can get away with. Outside of a few big swimbaits, there is no other bass application where I consistently use jigs in the three-quarter to one ounce range. But for grinding bottom in deep water, the heavier the better. The popularity of Football Jigs is apparent when looking through the Do-It catalog. They have twelve different models available to make Football as light as one-eighth ounce up to a monster one and a half ounce model. My thirty year old blue handle model FBB-7-A is still a great mold. It makes 7 sizes ranging from one-eighth to one ounce. It’s designed to take a typical Eagle Claw 570 hook but I have easily substituted some of the newer high strength premium hooks made by Eagle Claw, Mustad Gamakatsu, and Owner. But since my first model, a couple other great Football variations have come along. 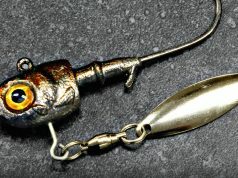 The weedless Football has become almost standard for most anglers. Weedless is a little deceiving since this is primarily a hard bottom jig and technique. A better term would be a snag guard, brush guard, or crib guard. This guard really doesn’t fend off weeds with this technique, but it does fend off everything else you encounter around deep hard bottom areas. Weights available with the weed guard vary from one-eighth to one and a half ounces. For Bass fishermen, the model FBB-3M-AFM is perfect, offering one-half, three-quarters, and one ounce cavities. Those will cover you in most of the Midwest and Great Lakes waters. One of the newest additions is the Football Jig with the Screw-loc. The Screw-Loc offers a perfect connection for today’s huge variety of soft plastics. Once the plastic bait is attached to the Screw-Loc, the hook can be buried in the plastic and become snag-proof. Let’s talk basic Football head tactics. Again, the football is heavy, stable, and made to pound and grind bottom. It excels on sand, rock, and gravel bottoms. Mid lake reefs, hard bottom drop offs, or sand and gravel flats are prime real estate for Footballs. 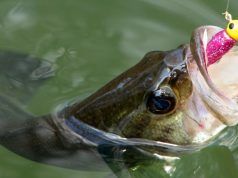 Whether they are rigged with plastics, tied with bucktail, or rigged with a rubber skirt, they imitate one of the Basses favorite foods…. the crawfish. A Football crawls over rocks kicking up sand, small rocks, moss and silt just like live craw-daddy! What’s a little different with the Football head is the retrieve. Unlike the hopping action usually imparted on jigs, Footballs are made for dragging. Cast them out and let them get to the bottom. With the rod about two or three o’clock slowly reel it along the bottom. If you hit something bigger, lift the jig a little to free it but then keep slowly plowing the bottom. Pause every three to six feet and let the jig rest while you jiggle it in place. Most of the retrieve is with the reel and not the rod. If you aren’t keeping in contact with the bottom, go heavier. Hits will be a definite thump and don’t wait to strike back. With these heavy heads they won’t hang on long. Stick them immediately. When I first started catching Door County Smallies on Footballs, I dressed them with a simple 3” Mr. Twister Twin tail. That combo is still great and catches up Bass everywhere. A lot of big bass anglers like Hula grub type baits on their Football heads. Or for a bigger bait yet, try a typical rubber skirt with a hula grub or beaver type bait. But let’s not forget other species or imitating other food options. With the invasion of the Gobies on the Great lakes, Footballs are perfect for imitating their bottom dwelling behaviors. Goby plastics or natural tied dressings in olives and browns on a Football head look just like a goby. A 4” fluke type bait or Gulp minnow on a Football head looks just like a minnow foraging the bottom and works great for Walleye, Bass, and even Great Lakes trout like Browns and Lakers. And don’t forget big pike and Musky. A one or one and a half ounce Football tipped with a big plastic like a 7” Fin S Fish, 8” Reaper, or Mann’s Jelly Hoo is deadly on deep clear hard bottom lakes. Football heads are a unique jig presentation that helps you find deep hard bottom gamefish. Whether you haven’t ever tried them, or have used them for years, it’s time to try making them yourself. This presentation probes the bottom and finds its way into spots you can’t find with other lures. You will lose a few doing that, so this mold will pay for itself in the first two trips. And, like I always say, there is nothing better than catching fish on a lure you made yourself. Here’s an “oldie but a goodie” on Do-It football jigs. Shop Do-It Jig Molds & try it for yourself!